I have a longer post coming, and I generally don't post pictures of myself, but I couldn't resist putting these up for the world to see. Plus, if someone (besides members of my family) is able to identify me from these images, well, then, that person deserves a medal. The photo above was taken somewhere in New York City circa 1981. 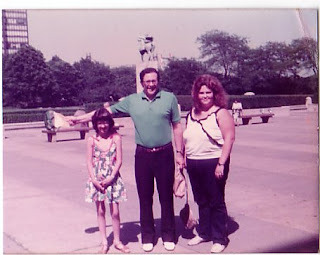 I'm on the far left, Dad's in the middle, and my sister with her Bette Midler hair is on the right. This 1984 picture is infamous in our family. 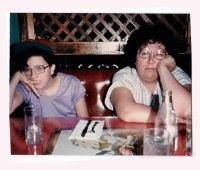 Dad took the picture of me and my mom when we were in some Chinese restaurant in New Orleans, waiting for our food after a long day's walking about the Big Easy. God, I hate those glasses. 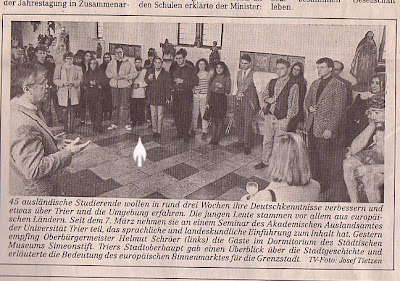 Here I am in a German newspaper during my semester abroad in college. I'm right above that white arrow, next to my then-boyfriend. That's the mayor on the far left. Oh. My. God. I can see why it's infamous. That middle picture is freaking awesome. I love it. It has a real album cover quality about it. You know with its whole "Bored Americana" vibe. Yeah, the middle picture is my favorite. In fact, I scanned the picture so I'd have an electric copy forever. Happy Columbus Day! So Canadians celebrate Thanksgiving on our Columbus Day...you know, that actually makes more sense than our fourth Thursday of November deal. Anyway, I agree, Anna Faris does not need to fire her agent. I mean, the Scary Movie movies may be lame, but they pretty much put her on the comedy map. And she's appeared two of the most beloved films of the decade (Lost in Translation and Brokeback Mountain). I just came back from voting and can you believe I only had four candidates to choose from? What a rip off.